A loop is a block of statements that are repeated. A loop may be repeated a fixed number of times, repeat until some condition is met, or can loop indefinitely while the program is running. There are three main loop control structures available in Java: for, do and while. 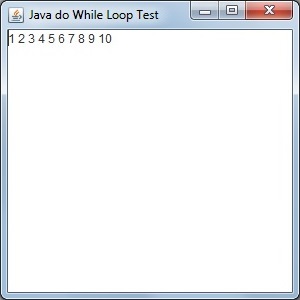 The do-while loop is similar to the while loop, except the conditional test is performed after the execution of the code in the loops code block. Shown below is an example of a do-while loop. The do-while loop starts out by executing the code inside the code block of the loop. Inside the code block of the while loop, the value of iVal is incremented (increased) by 1. After the code inside the code block is executed, the conditional test checks if the value in the variable iVal is less than 10. While this condition is true, the do-while loop continues. The value of iVal will be incremented each time the while condition is true. On the tenth iteration through the loop, the value of iVal will not be less than 10, so the condition in the while text will turn false and the loop will exit. Note: some important things about the do-while loop is that the statements within the do-while code block are always executed at least once, and something must happen within the code block to change the test variable or it will loop indefinitely. In the code above, the code in the do-while loop code block uses the valueOf method to convert iVal to a string and then concatenates it onto the end of the string variable outData. A JTextArea object named myTextis created, and the line myText.append(outData) places the outData string in the JTextArea for display in the program window.